An Arianespace Vega rocket carries ESA's IXV space plane to space for a 100 minute test on Feb. 11, 2015. A European mini-space shuttle prototype launched into space Wednesday (Feb. 11) and then zoomed back to Earth in a daring test of innovative technologies for future reusable spacecraft. 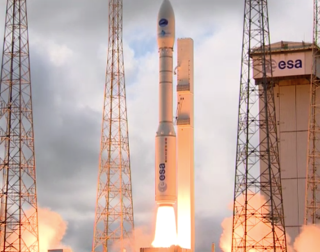 The European Space Agency's car-size Intermediate eXperimental Vehicle (IXV) blasted off atop a Vega rocket from the European Spaceport in French Guiana at 8:40 a.m. EST (1340 GMT) Wednesday. The spacecraft was initially expected to launch at 8 a.m. EST, but a problem with telemetry delayed the liftoff within the one hour and 45 minute launch window. The craft came back to Earth about 100 minutes after launch, making a parachute-assisted splashdown in the middle of the Pacific Ocean at about 10:20 a.m. (1520 GMT). A recovery ship is stationed near the splashdown zone and is on its way to collect the IXV, European Space Agency (ESA) officials said. Europe's IXV mission launches on a Vega rocket eastward from French Guiana on a suborbital path, then lands in the Pacific Ocean for recovery by ship, followed by post-flight analysis. The mission is scheduled to launch on Feb. 11, 2015. The experimental vehicle is a wingless "lifting body" rather than a true space plane. It measures 16.4 feet long by 4.9 feet high by 7.2 feet wide (5 by 1.5 by 2.2 meters) and weighs almost 2 tons (1,814 kilograms) when fully fueled, ESA officials said. The European Space Agency's small Intermediate eXperimental Vehicle could pave the way for future orbital space planes. See how the IXV space plane works in this infographic. During today's suborbital flight, the IXV was expected to reach a maximum altitude of about 261 miles (420 kilometers), then barrel back into Earth's atmosphere at a speed of 16,800 mph (27,037 km/h). The vehicle was also designed to use an advanced infrared camera and more than 300 other sensors to assess how its thermal protection, guidance and other key systems perform during re-entry. ESA considers IXV an important step along the path to mastering autonomous, controlled re-entry technology. "Such a capability is essential for developing a wide range of space transportation applications, including space planes, reusable launcher stages, planetary probes and sample return, cargo and crew transport vehicles," ESA officials wrote in an IXV mission FAQ. "Mastery of re-entry technology could also be useful in innovative future missions for Earth observation, microgravity experimentation, high-altitude atmospheric research and servicing and disposing of future-generation satellites." IXV is considered "intermediate" because it follows the 1998 flight of the Atmospheric Reentry Demonstrator (ARD) capsule and precedes an envisioned space plane project called PRIDE (Program for Reusable In-orbit Demonstrator for Europe). "It would be launched by Europe’s Vega light rocket, orbit robotically, operate in orbit and land automatically on ground in a runway," they added. "The mission will focus on system and technology performance verification under all flight conditions — hypersonic, supersonic, transonic and subsonic." PRIDE would serve as an on-orbit testbed for a variety of technologies, ESA officials said. This is the X-37B's primary stated purpose as well, though the payloads carried by the U.S. military space plane are classified. The total cost of the IXV mission is around 150 million euros (U.S. $170 million at current exchange rates), excluding the cost of the Vega rocket. IXV was originally supposed to launch in November, but the mission was postponed to perform further safety analyses of the flight path, which was a novel one for the rocket. Vega launch vehicles traditionally travel northward to get satellites into a polar orbit, rather than eastward on a suborbital path, as called for by the IXV mission.